The Golden Gate Strait is the entrance to the San Francisco Bay from the Pacific Ocean. The strait is approximately three-miles long by one-mile wide with currents ranging from 4.5 to 7.5 knots. It is generally accepted that the strait was named "Chrysopylae", or Golden Gate, by John C. Fremont, Captain, topographical Engineers of the U.S. Army circa 1846. It reminded him of a harbor in Instanbul named Chrysoceras or Golden Horn.The dream of spanning the Golden Gate Strait had been around for well over a century before the Golden Gate Bridge opened to traffic on May 28, 1937. 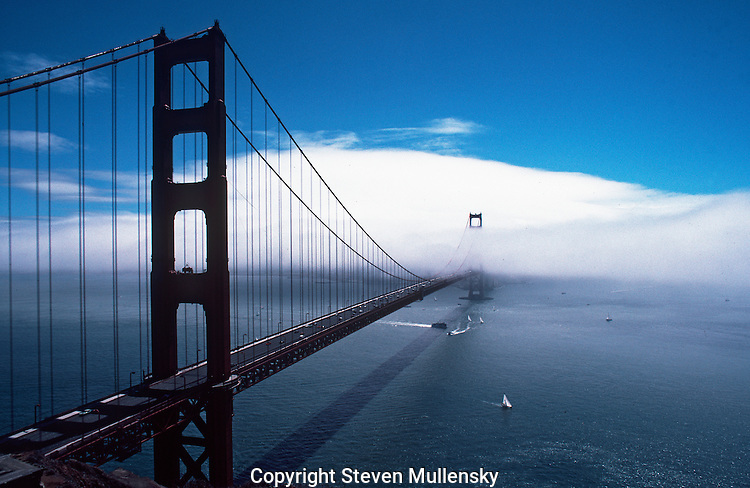 Pedestrian Day was held on May 27, 1937.The Golden Gate Bridge has a total of 250 pairs of vertical suspender ropes. Each suspender rope is 2 11/16 in. in diameter. All of the ropes were replaced between 1972 and 1976, with the last rope replacement completed on May 4, 1976.